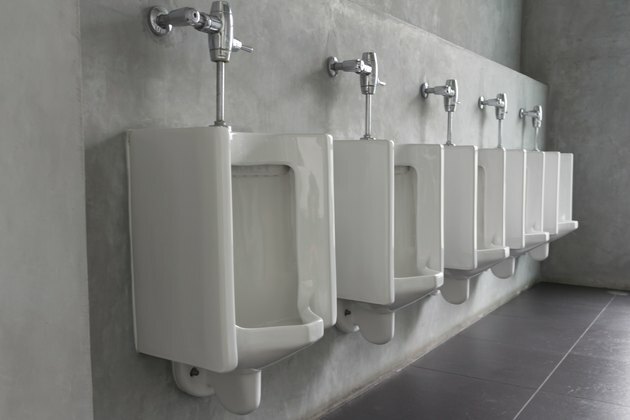 To install the flushometer on a urinal, you'll first need to install a urinal spud into the water inlet connection in the urinal. The urinal spud prevents the flushometer from leaking during flushing. Assembling the unit only takes a few minutes and requires just one common household tool. Insert the threaded side of the spud housing into the underside of the water inlet hole in the top of the urinal. Hold the spud housing in place with one hand. Insert the rubber gasket onto the threaded spud housing. The beveled end should fit securely into the water inlet hole. Place the metal washer on top of the rubber gasket. Place the locknut on top of the metal washer and gently screw it down with an adjustable wrench or channel locks. The spud housing will now stay in place and you can let go of it. Place the spud cover on top of the locknut and screw it in place by hand.